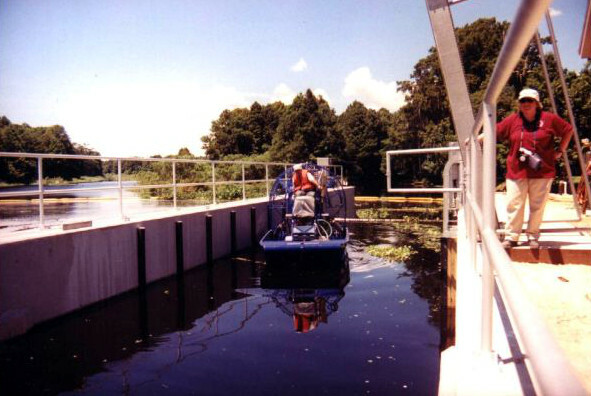 Navigation | Obermeyer Hydro, Inc.
Obermeyer Spillway Gates are ideal for low head navigation impoundments. Under high flow conditions, with water levels that allow barge traffic, the lack of intermediate piers enhances the safety of barge traffic going over the gates. The Obermeyer Spillway Gates can be proportionally controlled to maintain a constant upstream channel depth. Because all the gates act in unison the spillage flows are evenly distributed downstream, resulting in less channel scouring and optimum, uniform velocity navigation conditions. The Obermeyer service crane permits maintenance of individual air bladders and gates under a wide range of water elevations and flow conditions. The Obermeyer Spillway Gates may also be configured to control lock chambers. Obermeyer gates are also well suited for use as lock gates where they provide a number of advantages over conventional lock gates. The required concrete structures are very simple and inexpensive compared to those required for conventional lock gates. The gates may be raised and lowered concurrently with lock chamber water level adjustment. Pinch points are avoided which may otherwise present a safety hazard to people or wildlife (sea manatees, for example). Unlimited widths may be provided without the need for intermediate piers. This allows lockage of large vessels at low head with a very economical structure.